The leap to Bharat Stage VI (BS VI) emission standards is giving India’s auto industry sleepless nights. Mumbai, August 02, 2017: The year 2020 will mark an important chapter in India’s 67-year-old auto industry. That’s when automakers will take a giant leap forward and switch to far stricter emission standards that are on par with those in the US, Japan and the European Union. R.C. Bhargava, chairman of India’s largest car maker, Maruti Suzuki India Ltd, sees the shift as “natural evolution” for an industry that has come a long way since the pre-Liberalization era. The move is aimed at curbing emission in a country that has the dubious distinction of being home to half of the 20 most polluted cities in the world, according to World Health Organization (WTO) report released in June 2016. For Indian automakers such as Mahindra and Mahindra Ltd and Tata Motors Ltd, the efforts and capabilities required to leapfrog to Bharat Stage VI—the Indian equivalent of Euro VI, is akin to climbing the Mount Everest. It’s set to change the very DNA of auto companies, making them accountable for each unit of particulate matter and emission exhaled by automobiles. For car buyers, it would mean driving cleaner vehicles with advanced technology, albeit at a higher price. According to the reporsts published in livemint.com these are auto emission norms based on the European emission standards adopted in 2000. Each stage places a certain limit on pollutants released, which is controlled by the type of fuel produced by oil companies and the up-gradations and modifications made by automakers in vehicles to control pollutants such as NOx (Nitrogen Oxide) and particulate matter (PM). India has been adopting and enforcing the emission standards in a phased manner. BS III norms, for instance, were enforced across the country in October 2010 after they were first implemented in 13 major cities in April 2010. India now follows BS IV norms which came into effect in the entire country from April this year. Why is BS VI inevitable? The implementation of advanced norms is a critical step as India, the world’s third largest emitter after China and the US, is a signatory to Conference of Parties (CoP) protocol on combating climate change. As part of the agreement, by 2030 India has to reduce its carbon footprint by 33-35% from the 2005 levels. BS VI norms will address one of the inherent flaws in the European emission standards which permits diesel cars to emit more particulate matter and nitrogen oxide, said Anumita Roy Chowdhury, executive director at the Center for Science and Environment (CSE), a New Delhi-based think tank. Livemint.com also quoted that in diesel cars, the jump to BS VI norms will result in reduction of nitrogen oxide emission by 68% and particulate matter, which has a damaging effect on air quality and human health, by 82%. 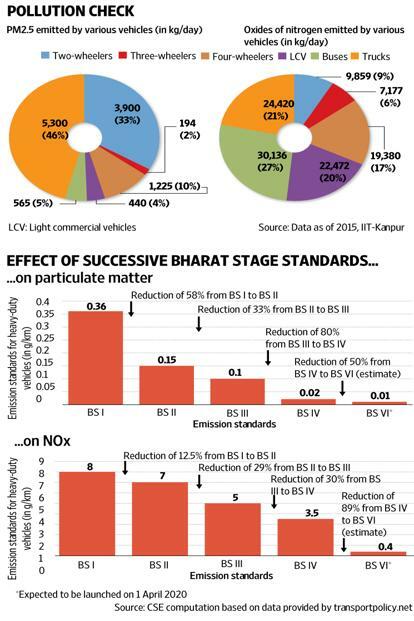 Similarly, in heavy-duty vehicles like trucks, the shift to BS VI norms would result in reduction of nitrogen oxide emissions by 87% and particulate matter by 67%. India bit the bullet on advancing emission norms last January—an idea that was first mooted in 2015 before the country signed the Paris Climate Change deal. Subsequently, on 6 January 2016, an inter-ministerial group meeting chaired by Union minister for road transport and highways Nitin Gadkari and attended by heavy industries minister Anant Geete, environment minister Prakash Javadekar (now education minister) and oil minister Dharmendra Pradhan, announced that not only would India skip the intermediary step but also advance adoption by three years to 2020 from 2023. By skipping one stage India will catch up with European emission standards which are currently ahead by five years. Even as environmentalists welcomed the decision, it set alarm bells ringing in boardrooms at auto companies and sent their product engineering teams into a huddle. Auto firms, parts makers and oil refiners are estimated to spend between Rs70,000 crore and Rs90,000 crore to comply with BS VI standards. According to the reports filed by Shally Seth Mohile in livemint.com given the high volumes and their presence in myriad segments of the automobile market, the leap to stage VI is giving executives at home-grown auto firms like Tata Motors and Mahindra and Mahindra sleepless nights. Unlike the local arms of the global automakers that have parent companies to fall back on, Indian companies will have to develop solutions ground up with the help of global firms specializing in emission control technologies. “It’s a massive work. This change took Europe nine years, we have to do it in three years,” said Timothy Leverton, chief technology officer at Tata Motors Ltd.
Rajan Wadhera, president automotive sector at Mahindra and Mahindra Ltd, echoed similar sentiments. “In my last 50 years, I have not seen this kind of challenge. It’s far more difficult than most of the technical transformation that I have seen in my career,” he said. But, he added, Mahindra is bracing for the challenge to ensure all its vehicles are compliant. Car market leader Maruti Suzuki India Ltd has around half a dozen passenger vehicle platforms, 16 models and around 150 variants. C.V. Raman, executive director, engineering, at Maruti Suzuki India, declined to comment for the story. An email sent to Volkswagen Passenger Cars India Pvt. Ltd remained unanswered. In an email response, a spokesperson at Hyundai Motor India Ltd said Hyundai as a global company has the technology available and is continuously introducing the same in India and meeting all the requirements. The automaker is geared up towards leading the introduction of BS VI, he said. CSE’s Roychowdhury said the transition to BS VI will bring a “paradigm shift in vehicle technology, particularly, for diesel vehicles,” as it will fundamentally alter the way emission is monitored even as it marks several firsts for the industry. Here is how: It will require manufacturers, for the first time in India, to maintain service check data even for in-use vehicles and the way they are performing in actual road conditions. Today, the only mechanism we have to check emission from in-use on-road vehicles is a PUC (pollution under check) certificate, which Roychowdhury alludes to as “sham,” owing to its inability to check pollution effectively. Also, for the first time, India will introduce real driving emission (RDE) standards that will be gauged through an on-board monitoring while the vehicle is being driven. It will monitor real-world emission from the vehicle and ensure that the sophisticated emission control systems fitted in the BS VI vehicles work at optimum efficiency through the life of the vehicle. With innumerable cases of in-road Euro-VI compliant vehicles emitting more than the permissible limit globally, RDE standards will be very helpful in monitoring emission effectively. In September 2015, US regulator Environmental Protection Agency (EPA) found that many Volkswagen cars being sold in America had a “defeat device” —or software—in diesel engines that could detect when they were being tested and could change performance to improve results. This allowed the engines to emit nitrogen oxide pollutants up to 40 times above what is permitted in the US. Volkswagen admitted it was guilty of manipulating test results and recalled from all across the world 11 million diesel cars fitted with software which helped in the manipulation. The RDE in India is being derived from the European emission regulations, said Rashmi Urdhwareshe, director at the Pune-based Automotive Research Association of India, the automotive R&D, testing and certification agency. However, the RDE cycle in India is completely different. “It’s still under discussion in what ways is it different,” she said, adding that data collection for it is underway. With the help of the data, the government and the test agencies will be able to firm up an agreeable test cycle for RDE in India. The exercise is expected to be completed in a year’s time. Automakers will develop and calibrate the BS VI vehicles for RDE accordingly. The emission standards will also mark a shift in the manner in which PM is regulated. Presently, it’s regulated based on mass of PM that comes out per kilometer of distance travelled. To regulate the very fine particles that come out of a vehicle, which are extremely harmful, India will switch to number standards for PM—regulating the number of units coming out. Officials at OMCs said they are geared up for this. A director of refineries at one of the oil marketing companies, who declined to be identified, said oil refinery firms including Reliance Industries, Bharat Oman Refineries Ltd (a joint venture company of Bharat Petroleum Corp. Ltd and Oman Oil SAOC, Sultanate of Oman) will be BS VI compliant. “Some of the other refiners will also be partially BS VI compliant and will be able to give quantities for testing in special batches,” he said. “In my last 50 years, I have not seen this kind of challenge. It’s far more difficult than most of the technical transformation that I have seen in my career”- Rajan Wadhera, president automotive sector at Mahindra and Mahindra. Automakers are also seeking clarity from the government on whether the 1 April 2020 deadline, is applicable only for manufacturing or both manufacturing and registration of BS VI vehicles . If it’s the latter, to ensure vehicles are available for registration from 1 April, auto companies will have to start manufacturing BS VI vehicles from the beginning of 2019, said Vishnu Mathur, director general at Society of Indian Automobile Manufacturers (Siam). “There has to be enough clarity on the date of manufacturing and registration,” said Mathur. Also, if the deadline is applicable for both, oil companies will have to also ensure fuel availability well in advance. The stock has to be ready before 1 April. “If it becomes registration, we have accepted a highly ambiguous target,” Mathur added. Toyota’s Viswanathan agreed: “At the end of the day, we don’t want a relaxation. We want it only when it’s suddenly sprung on us.” If the timelines are well defined, adhered to not only by the auto firms but OMCs also, the transition will be smooth, he said. It’s just that they will now have to develop the requisite technologies and capabilities locally as against importing them as the scale is much bigger now, said Singh. India’s car market is expected to reach 4.8 million by 2020, he said. 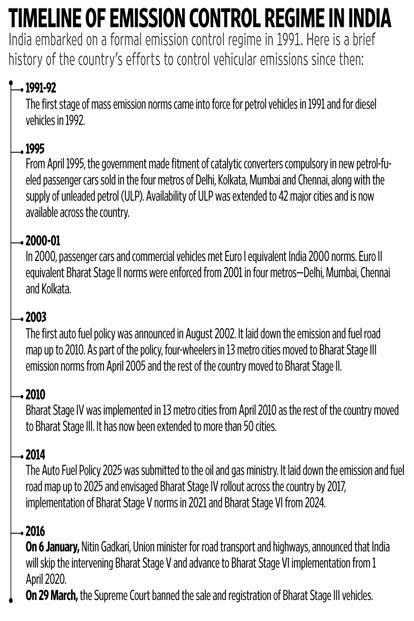 Come April 2020, India’s automobile market will change in more ways than one, as the industry leapfrogs to the strictest emission norms—Bharat Stage VI—from the current BS IV. In a three-part series, Mint analyses the impact of the transition on the environment, automakers and their supply chains, and car and two-wheeler buyers ivemint.com further added.